Crime and what does it have to do with me? While I rarely write about my work and have recently taken some side trips posting about Pokémon Go (no fear regular readers, quilting and fashion posts will soon return), there are some observations I have made after reading page upon page of California criminal appeals. What you read or see in the news is just a small portion of the detail related to violent crime. It is heartbreaking and there are times I weep for the victims as I read the statement of facts for accuracy. What I can offer is advice you have probably seen - most likely also given from law enforcement. Be aware of your surroundings - that includes walking, jogging while listening to your iPod with ear plugs, better to be "unplugged." Women - do not go to bars alone, ever. Arm yourself and become proficient at using a weapon. Seems counterintuitive for those calling for gun control but there is a reason, there are very bad people out there that want to do you harm - more out there than you could possibly imagine. Lock your doors and absolutely don't open them for strangers. Women - if you are with a man that is not the father of your children, do not allow yourself to become impaired in any way, it is usually during that time your children will likely be victimized. Do not leave your children alone with a man, only after he has proven himself to hold you and your child's interests foremost. Gang members hold allegiance to their gangs, not to their partners, and will do harm to their own women if the gang decrees she has "done something wrong." I have read more than one case where a gang member's woman, pregnant with child, was terminated in the most horrific way. Of course, the tendency is to think, "It will never happen to me or my family," and with Godspeed and good luck it perhaps never will, but take a moment to think of those who have suffered, say a prayer for them and stay safe. Feed those critters raspberries for easier catching them all. 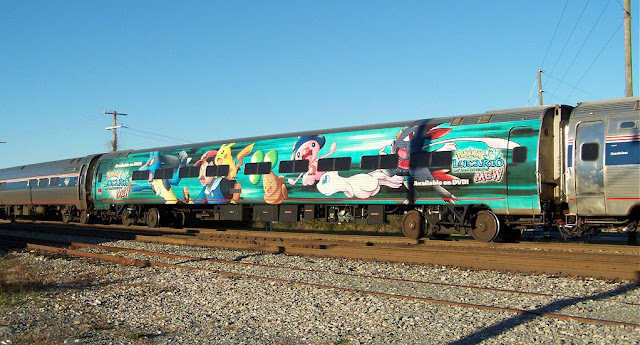 Seems Pokémon fall in love (either with you or the raspberry) and it distracts them while you launch pokeballs at them. If you haven't evolved your pokepets yet, after you have transferred a few to the Professor (you don't need 18 paras), you earn candies. These candies go toward pokemon evolutions. When the pokemon evolve, it doesn't seem to be a very pleasant experience for them. Some make odd noises after evolution that sound something like a bark, sneeze or hiccup. It cracks me up. In your bag of items there is a lucky egg, save this puppy for evolving all of your pokemon that have enough candies. The lucky egg earns double XP for 30 minutes. On your pokemon tab there is another tab called "eggs" so you choose the 5.0 km ones (ignore the 2.0 ones) and choose to incubate them. After you have walked awhile, this will count toward hatching them. My latest hatched baby was a Magnemite. I spent the weekend on the California coast and there I found numerous "water" pokemon like Magikarp and Staryu. All the more reason to hang out at the beach! 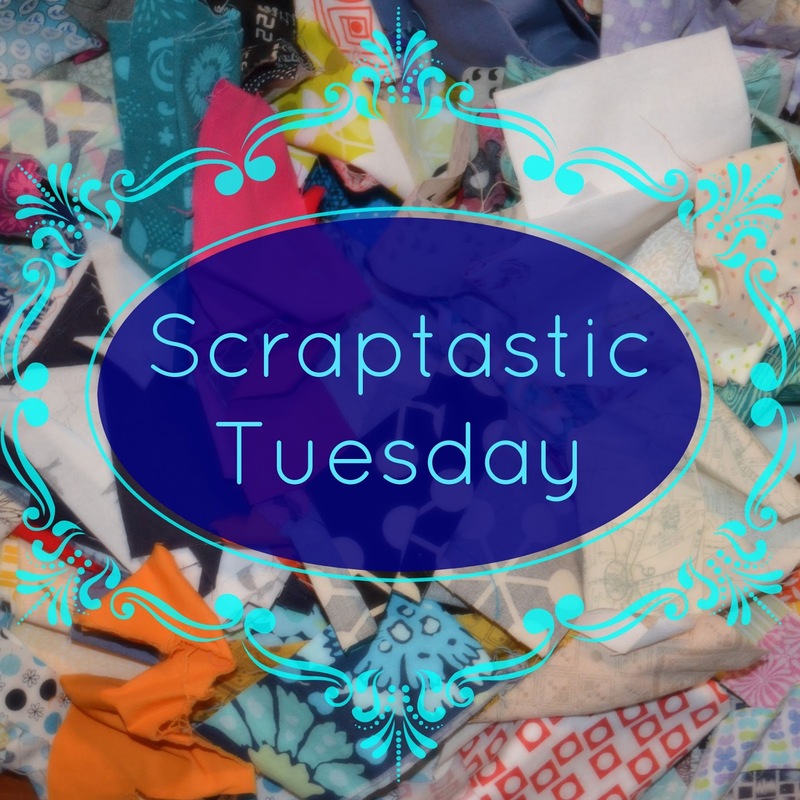 I am on a fabric and quilt-related "roll" when it comes to this month's thrifting. Hospice thrift produced these items for $6.75. Batting ($1), mystery bag of fabric ($2), Christmas paisley 3 yards of fabric ($2), a bag of lemon/verbena soap ($1.50) and mystery bag of cut fabric squares ($1), the lot at 10% off. Mystery fabric of pre-cut solid squares solved the binding problem for my brother's retirement quilt (to be revealed when finished), the WIP is on my Instagram feed under tvonzalez. I am going to chain piece the squares together. The $2.00 mystery bag of fabric revealed this sunflower collection. I am sorely tempted to bump my Halloween quilting project to make a small sunflower creation. 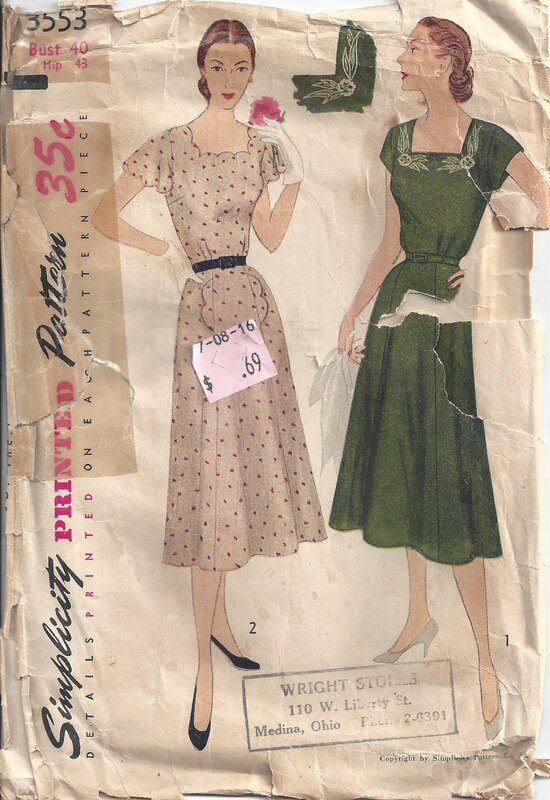 Pattern of the day presumed to be one from the 1940s, undated Simplicity 3553. I had to leave the thrift shop sticker price on it because it lifted off the image. 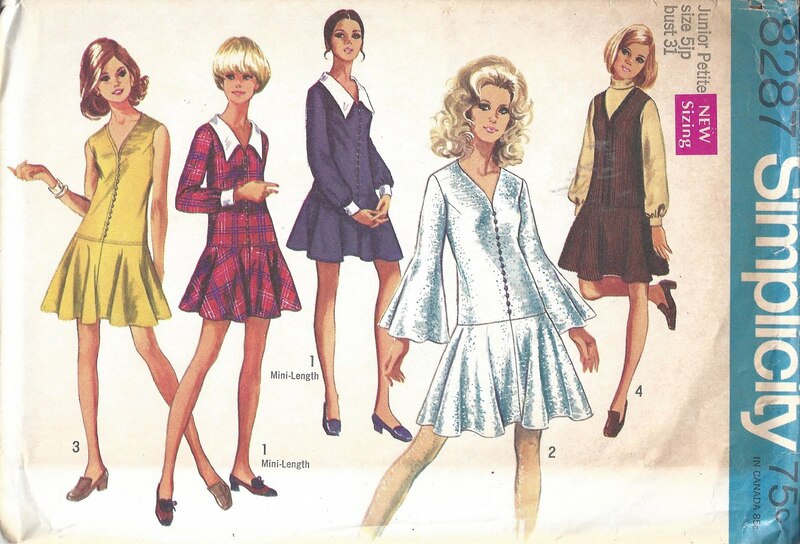 One of the items on my thrift shop bucket list is a retro dress form. I passed one up a couple of years and have been kicking myself ever since. 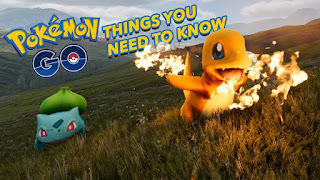 Pokémon Go players - my newest discovery is Incense that lures wild Pokémon to your location for 30 minutes. While it didn't attract any rare or unusuals, I did throw pokeballs during my lunch hour while sitting on a park bench. I hatched a couple of eggs, earned some type of 3 egg hatching medal but still don't know what to do with it. I also powered up and evolved a few of my Pokémon. Again, I don't know why, just seemed like the thing to do. On to Instagram, as noted in my previous post, my newest social media move. 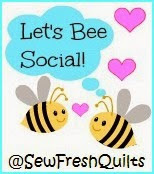 Having completed an incredibly fun challenge with a quilting group, my next group of daily prompts originate from thesitsgirls.com beginning September 15th. While not the most inspired prompts, it will be interesting to see what the other participants come up with. Maybe I can throw some mischief into the mix and create an uproar. 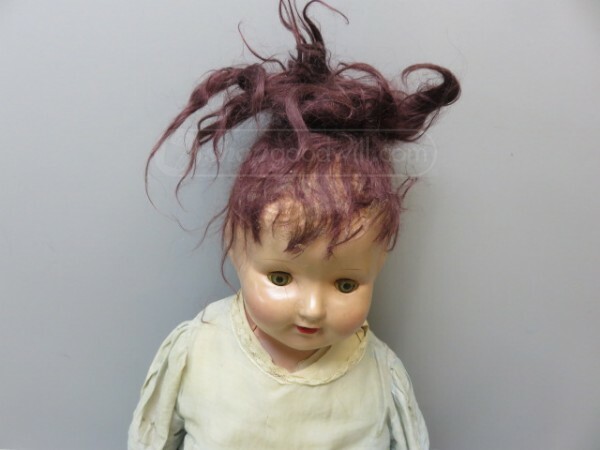 Ending with baby doll mugshots, because sometimes you feel like a train wreck by week's end. These three inmates are currently offered for sale on shopgoodwill.com. The reason I think Instagram is so much fun is you can distill an idea into one image, post with a hashtag and discover all of the others in that category. This is the latest one I have posted to participating in an IG contest hosted by theb***hystitcher. The prompt for Friday, August 12th is #mysewingroommascot and she has joined my clan. 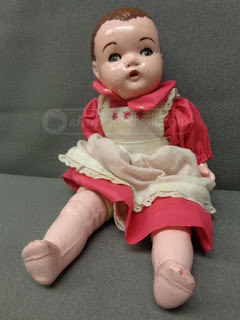 I spent less than $5 for the lot at hospice thrift of the doll (missing one arm $1.50), clip-on earrings on her sunbonnet ($1.50) and Disney salt and pepper shaker bells ($1.50). If you want to join in, her next prompt will land on Monday, August 15th and continue through Thursday, August 18. Photo contests are tons of fun. 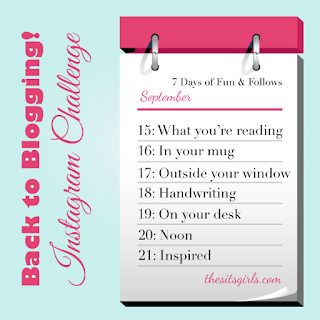 I was having a tough time finding a group to share images through the blogging world, Instagram has saved the day! Now that I have lurked around rectangles and squares long enough, it is time to take a stab at paper piecing. Those not in the know about such quilting techniques, it is using paper, freezer paper to join all those little fabric pieces into a glorious material mosaic. I am preparing for an upcoming blog hop in October with Marian at www.seamstobesew.com. Signups are open until September 6th. I hope to show off some of my newly acquired paper piecing skills (or lack thereof). Pokémon Go update: New tips from fellow players. When the Pokestops are sparkling that can last for about 15 minutes and it attracts Pokémon. While eating my lunch on Friday, I got to catch them little buggers. My own sound effects include saying "boink" when I land a pokeball on a Pokémon's head. You can use raspberries for easier capture. You can hatch eggs - what happens after that, I am not quite sure. I have been in a mood for fashion and for things to refashion but have been finding more fabric and sewing items. This quilt top utilized blue checkboard squares, summer squares and kitty print panels. Since I was repurposing the fabric squares, I knew it would take more measuring to square them up. Ty Aurora and a Florida souvenir plate joined my collections. 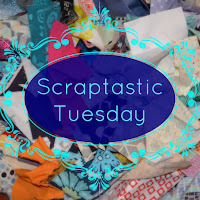 Thrift shopping had it all sewn up with finds of a $5 sewing basket filled with goodies and $2 bag of fabric squares. Contents of the basket included thread, buttons, needles, thimbles, pin cushions, scissors and lace. I was one happy thrifter all afternoon. The volunteer told me it had processed through the shop on Tuesday and I found it that Saturday. Pattern of the Day from 1971 picks up the blue and yellow in my checkboard quilt. Where have all the fashion bloggers gone? In answer to my own question, they have moved over to Instagram. Have to admit I was one of the holdouts. I am on IG now too (as tamaschen) but have stopped posting full length images of myself. 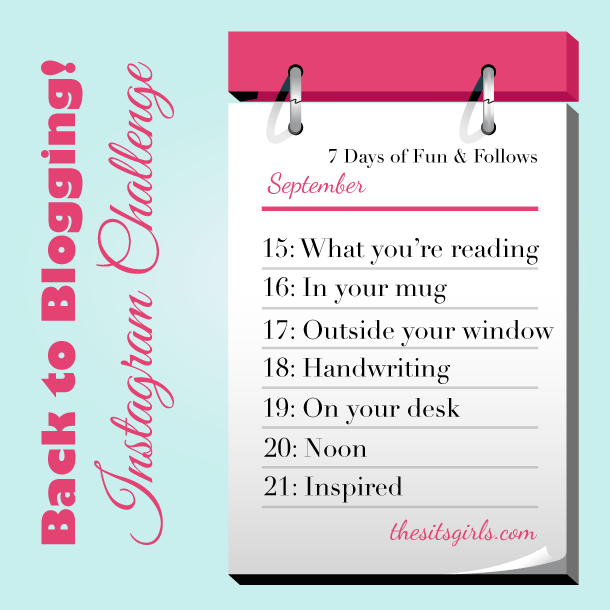 I so love the blogging format and it isn't as restrictive as Instagram, such as not being able to post a link in comments and the image needs to originate from your phone (I still utilize my digital camera for some photo shoots). 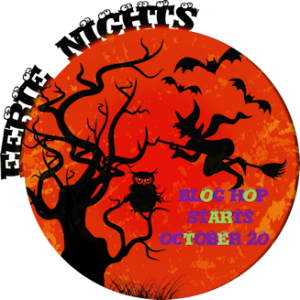 My work around for the latter is to go to my blog, save the image to my phone and then post on IG. It makes sense for the fashion bloggers to utilize Instagram. They can post the OOTD (outfit of the day). The fashion behind the getting ready image is a $3 JonesWear plaid summer suit (with coat length jacket) purchased at Thrift Town for the 50% off clothing day. With a different pair of heels, this will be my go-to interview suit. Sutter Creek's Interfaith Great Finds was my go-to thrifting spot during the latest heat wave. 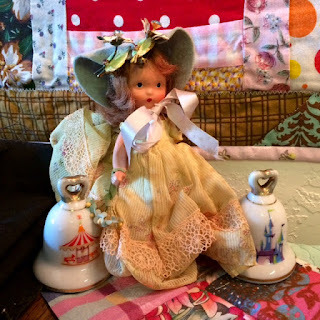 I purchased the bright orange woven piece and a $1 mystery bag of fabric along with a quilting book, two necklaces, a yellow frame and flower magnets totaling less than $9. Contents of the mystery bag of fabric were varied and colorful. I popped them all in a washable lingerie bag so they would be freshened up and fray less as they washed. Too bad I didn't think of that sooner - there was a lot less fraying. 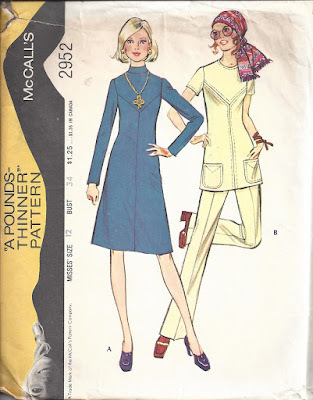 Pattern of the Day is a sassy Simplicity from 1969. Do you post on Instagram? Have you noticed more people moving over to that site?